Deer Flats Nature Trail is the longest trail at Young State Park, a 3-mile loop that stays predominately in low-lying woods. It shares a segment with White Birch Nature Trail and all of it is utilized during the winter as part of the park’s Nordic trail system. Although called a nature trail, the interpretive portion of the path is limited to six display signs that identify tree species along the trail. It makes for a pleasant and easy hike, however, as it is level, well marked and closed to mountain bikes. This is an especially good choice for families with young children but keep in mind that while most of the trail is well-planked, there can be wet sections in he spring and after a heavy rain. You can pick up the trail several places within the park. If camping, there is a short spur that begins next to the Timbledoodle Mini-Cabin in the Terrace Campground and leads just pass post No. 4. The description below begins at the trailhead on the opposite side of the park road from of the park office. Within the parking area there is a trail sign with a map and a vault toilet. The path enters the woods and quickly arrives at post No. 5. Head west (right) along what appears to be an old two-track that is slowly reverting to a foot path. Within a half mile you pass a spur that heads right to the park road and then a bench and a junction just beyond. This spur leads to the park’s sanitation station for recreational vehicles. The main trail remains in the woods and reaches post No. 3 at Mile 1.2 and post No. 4 a hundred yards beyond it. Both mark spurs that provide campers access to the trails system while at post No. 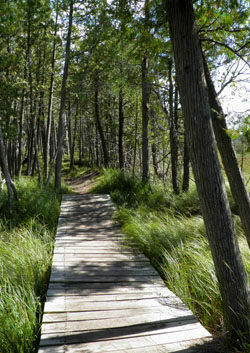 4 you can head right to continue on the lakeshore portion of White Birch Nature Trail. 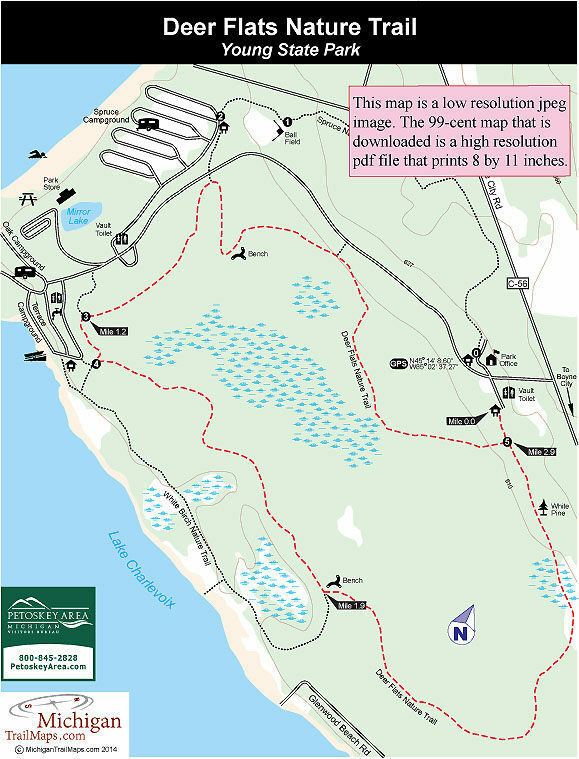 If you remain on Deer Flats, the trail remains in the woods and reaches a junction and bench at Mile 1.9, marking the return of the lakeshore path. From here you swing through the east end of the park in the most interesting stretch of the loop. You begin in a cedar swamp and then breakout in an open cattail marsh where planking keeps your boots dry. At Mile 2.8 you pass an impressive white pine impossible to miss. Just beyond the towering tree is post No. 5 and the spur to the trailhead parking area, reached at Mile 3.0. Young State Park has 240 modern sites spread out in three campgrounds. Oak Campground has 41 sites, including a row of them right on the shoreline of Lake Charlevoix, while next to it is Terrace Campground with an additional 41 sites. Both are wooded areas with well-shaded sites to make camp. Spruce Campground, north of the day-use facility, is the largest with 158 sites situated in an open, grassy area. The three campgrounds are often filled from the Fourth of July weekend to mid-August. There are 1.5-miles of lakeshore within the park including a wide, sandy beach in its day-use area. Overlooking the beach and a grassy picnic area is a concession store while in Terrace Campground is a boat ramp. Other facilities at Young State Park include a softball field and outdoor basketball court.